Delhi-based Holidify Travels Pvt Ltd, which runs an online portal for discovering offbeat travel destinations, has raised $100,000 (Rs 65 lakh) in angel funding from the promoter family of Aarti Group. Naman Sarawagi (founder of Findyogi) and angel investor Himanshu Sarawagi also participated in this round, Holidify said in a press statement. The company will use the money to strengthen its technology platform and expand content base. Holidify was founded in 2014 by IIT Bombay alumni Rohit Shroff and Kovid Kapoor. Prior to starting Holidify, Shroff worked with Indus Insights while Kapoor was employed at Opera Solutions. 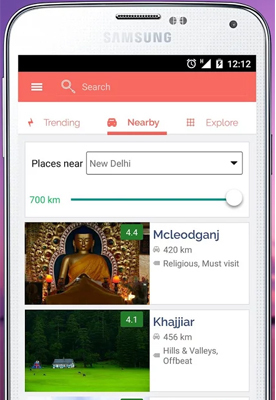 Holidify, which uses maps and comprehensive travel guides, claims that its platform gets about 5 lakh unique monthly visitors. It has a recommendation engine that shows results tailored to a user's location. The company claims that its app has been downloaded over 10,000 times, making it the highest rated travel app on Play Store. Founded by Chandrakant Gogri in 1975, the BSE-listed Aarti Group is a leading supplier of dyes, pigments, agrochemicals, pharmaceuticals and rubber chemicals. The promoters of Aarti Industries had earlier invested in edu-tech startup Plancess, Bewakoof.com and Humming (maker of Gladius Technology cricket bats). In the travel technology space, Tripoto Travel Pvt Ltd, which owns and operates travel itinerary portal Tripoto.com, recently raised an undisclosed amount in funding from 500 Startups, IDG Ventures and advantEdge Partners. In June, tour guide app Guiddo had raised an undisclosed amount in seed funding from Pawan Borle, senior vice-president at Fly Dubai; Abrar Ahmad, partner at TravelCapitalist Ventures; Nirmal Singh, part of Team Ducab; Vishal Shah, founder AcFin Consulting; Sanjay Shah and Ushik Gala, who are serial angel investors in India. Techircle.in had reported in July that Guiddoo was in final stages of raising another round of funding from SAIF Partners and Helion Venture Partners among other investors. Aarti Group Holidify Travels Pvt. Ltd.